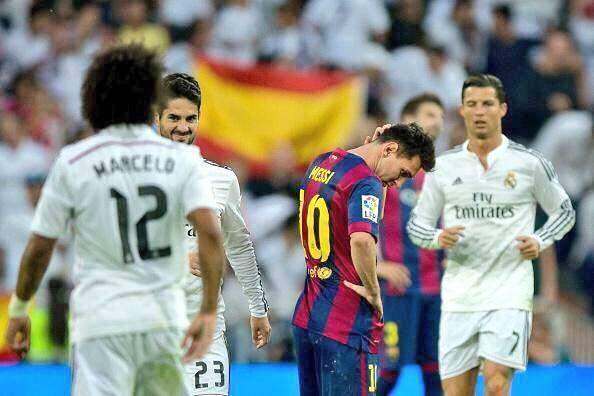 A dejected Lionel Messi the backdrop of Real Madrid's triumph. A thrilling El Clasico saw Real Madrid outclass Barcelona with a masterful 3-1 victory at the Santiago Bernabeu. With a statement made by Los Blancos and issues arising for the Blaugruna, here are six things we learned from the game. Football teaches us a plethora of lessons, like the fact that any team can be beaten. But, with a statement-making win over Barcelona in the Clasico, Real Madrid began to unearth incomprehensible heights. And who spearheads this startling ambition? Cristiano Ronaldo. Los Blancos' star man has scored 21 goals in 14 games, that is just phenomenal. Despite his penalty, Ronaldo hardly shined in the fixture but for him to continue his scoring form is a sensational asset to the club. At the start of the week, Real Madrid had two huge tests ahead — Liverpool and Real Madrid. They passed both with flying colours. In a team that continues to demolish those smaller sides and out-perform the bigger challenges, the success this club can reach is just profound. Now it comes down to that awkward case of consistency. Should the Spaniards continue this roll, not only will they conquer Spain, but Europe entirely. One of the most interesting things to watch in the Clasico was how Real Madrid's midfield outplayed their Catalanian counterparts. Even with Xavi and Andres Iniesta re-igniting their partnership, of which reigned over a dominant era for Barça, wasn't enough to really dictate the play throughout the contest. Gareth Bale's absence forced Ancelotti to make a change. Using Modric, Isco, Rodriguez and Kroos worked wonders. Not only did they further catalyse the rampantly-paced attacks, but they also were grafting out the tracking back to really hold against Barcelona. Real Madrid used to be a story of the lethality from Benzema, Ronaldo and Bale. Now, rising up the ranks, as shown in the Clasico, is their stacked midfield. Luis Suarez started for Barcelona in the Clasico, making an impact within four minutes as he assisted Neymar for the opener. However, placed on the right-wing, the Uruguayan didn't have much of a chance to make the impact of his usual, prolific self. Adapting to Luis Enrique's style is a task, even for the greatest of players like Suarez. It was far from a tragedy, but compared to the player that Barça paid for, he didn't do what he wanted — he didn't take the game by storm. Whether or not Suarez will move centrally or not remains to be seen, but if he does remain on the wings he shall need some time to evolve and really bring up the products. With this game temporarily excluded from the debate, both Barcelona and Real Madrid have been performing brilliantly. The win for Ancelotti's side saw them move within a point in the Liga BBVA league table. While it would be unwise to rule Atletico out of things, should they both continue this form, it shall come down to the Clasico. And if it does, the Blaugruna shall be hoping for much better results. The stage could be set. But still, on the 22 March, the title will be far from decided. But both sides will know that a win shall put daylight between their rivals. Going into the game, fans and players alike were hoping that the Clasico would shed more light on the Messi-Ronaldo debate. It hardly did. But, with Ronaldo being just that bit more active especially on the break, and a goal to go with it, he continued his form and reinforced his claim for winning the coveted player of the year award. While it's not too late for Messi to turn things around, and the World Cup final spot could go some way in favour of his argument, he will need himself to improve, which is likely, but also for Ronaldo to deteriorate, and that's not looking too likely right now. Barcelona have came across two true blockbuster games in their season so far, Paris Saint-Germain and Real Madrid. While they may have been away trips, they've lost both. Does that imply that Barcelona are only good against smaller teams? Absolutely not, it just shows that the team may not have jelled to rise to bigger occasions if anything. Those big games though, are the ones that count. And the sooner they can win them, the better their chances. One more thing I should have added: take this with a pinch of salt. These are lessons learned from just one game, and things will undoubtedly change throughout the season. A look at six lessons learned from El Clasico, featuring Real Madrid's 3-1 win over Barcelona.